The book “Rulers of Evil” by F. Tupper Saussy is an excellent piece of investigative prose. It is an expose of the power of the Jesuits (the Society of Jesus, the dark force that operates within the Roman Church) and how they instigated and fomented rebellions in Europe and America. It describes in detail, especially, how they brought about the American War of Independence from Great Britain and how they were instrumental in writing the Constitution, choosing the flag, the great seal of the United States and how they, through nefarious means, brought about and bring about the Catholicisation of America. As the title indicates it explains where the power for ruling the world comes from. The rulers of evil are under the authority of God and bear not the sword in vain. Romans 13:4 For he is the minister of God to you for good. But if you do that which is evil, be afraid; for he bears not the sword in vain: for he is the minister of God, a revenger to execute wrath upon him that does evil. They carry “the mark of Cain” (Genesis 4:15) which symbolises their God-sanctioned but Satan-directed authority in the world to keep in check the evildoers. This is not a role that Christian are authorised to take. This is the key point of the book and the protestant/ evangelical church has been duped and deceived by the workings of the Jesuits, with the ultimate purpose—the long end game—to bring them back to Rome. I recommend you read this book. It is available from amazon.com. But hardcover and very expensive. Kindle is much cheaper. I found a downloadable PDF version online here. The following are a few excerpts from the book that I found very eye-opening to say the least. was Christ-centered; gnostic learning was man-centered. gnosticism: the thought and practice especially of various cults of late pre-Christian and early Christian centuries distinguished by the conviction that matter is evil and that emancipation comes through gnosis (“knowing”). cabalah: (cabala, qabbala, etc) : a system of signs, letters, numbers, and images believed to put one in private communication with God and like-minded persons; a gnostic system marked by mysticism, magic, and a belief in creation through emanation; esoteric doctrine or mysterious art. On March 22, 1312, Clement V dissolved the Knights Templar with his decree Vox clamantis (“War Cry”) . But the dissolution proved a mere formality to further appease Philip. More importantly, it permitted the Templars, in other manifestations, to continue enriching the papacy. For Grand Master Jacques de Molay, just prior to his execution in 1313, sent the surviving thirteen French Templars to establish four new Metropolitan lodges: one at Stockholm for the north, one at Naples for the east, one at Paris for the south, and one at Edinburgh for the west. Thus, the Knights remained the militant arm of the papacy. Except that their wealth, their secrecy, their gnostic cabalism, and their oath of papal obedience were obscurely dispersed under a variety of corporate names. A subtle provision in Vox clamantis transferred most Templar estates to the Knights of St. John of Jerusalem, who took possession after King Philip’s death. In Germany and Austria, the Templars became “Rosicrucians” and “Teutonic Knights.” The Teutonic Knights grew strong in Mainz, birthplace of Gutenberg’s press. Six centuries later, as the “Teutonic Order,” the Knights would provide the nucleus of Adolf Hitler’s political support in Munich and Vienna. Iñigo de Loyola was the first Black Pope, founder and Superior General of the Society of Jesus. The fruits of the Germanicum were so successful that when the Council of Trent finally adjourned on December 4, 1563, its decrees and canons conceded nothing to the Protestant reformers. Indeed, under the spiritual direction of Superior General Diego Lainez – Ignatius [Loyola] had died in 1556 – the Council denied every Protestant doctrine point by point. Anathematized (eternally damned) was anyone who believed that salvation is God’s free gift to His faithful and does not depend upon partaking of Church sacraments. Anathematized was anyone who looked to the Bible for the ultimate authority on “doctrine, reproof, correction, and instruction in righteousness” rather than to the teaching Church. Anathematized was anyone who regarded as unworthy of belief such unscriptural doctrines as (1) the efficacy of papal indulgences, (2) of confession alone to a priest as necessary to salvation, (3) of the mass as a true and real sacrifice of the body of Christ necessary to salvation, (4) the legitimacy of teachings on purgatory, (5) the celibate priesthood, (6) invoking saints by prayer to intercede with God, (7) the veneration of relics, and (8) the use of images and symbols. The Council of Trent hurled one hundred twenty-five anathemas – eternal damnations – against Protestantism. Then, as an addendum to its closing statements, the Council recommended that the Jesuits “should be given pride of place over members of other orders as preachers and professors.” It was at Trent that the Roman Catholic Church began marching to the beat of the Black Papacy. He is a heretic who does not believe what the Roman Hierarchy teaches— A heretic merits the pains of fire…. By the Gospel, the canons, civil law, and custom, heretics must be burned…. For the suspicion alone of heresy, purgation is demanded…. Magistrates who refuse to take the oath for defense of the faith shall be suspected of heresy…. Wars may be commenced by the authority of the Church…. Indulgences for the remission of all sin belong to those who signed with the cross for the persecution of heretics…. Every individual may kill a heretic. Persons who betray heretics shall be rewarded …. Heretics may be forced to profess the Roman faith…. A heretic, as he sins in all places, may everywhere be judged…. Heretics must be sought after, and be corrected or exterminated …. Heretics enjoy no privileges in law or equity…. The goods of heretics are to be considered as confiscated from the perpetration of the crime… The pope can enact new articles of faith…. Definitions of popes and councils are to be received as infallible …. Inquisitors may torture witnesses to obtain the truth…. It is laudable to torture those of every class who are guilty of heresy…. The Pope has power over infidels…. The Church may make war with infidels— Those who are strongly suspected are to be reputed as heretics…. He who does not inform against heretics shall be deemed as suspected…. Inquisitors may allow heretics to witness against heretics, but not for them…. Inquisitors must not publish the names of informers, witnesses, and accusers…. Penitent heretics may be condemned to perpetual imprisonment. Inquisitors may provide for their own expenditures, and the salaries of their officers, from the property of heretics…. Inquisitors enjoy the benefits of a plenary indulgence [a full papal forgiveness of sin] at all times in life, and in death. He attracts followers and leads their souls to Hades, for which the Greeks gave him the title Psychopompas (from psycho- “soul” and pompous, “director”). Because Hades is not the most desirable of destinations, the Psychopomp had to construct elegant missionary adaptations. He had to charm souls, deceive them into following him any way he could – whether by words, sights, or sounds. Like Hg, his metallic form, Mercury could change his shape instantaneously. Did you see the villain in the movie Terminator II? With his ever-changing voices, physiognomies, and identities, he is state-of-the-art Psychopomp. In many cultures, Mercury’s ingenious deceptions earned him the title of “The Trickster.” He was patron deity of deceivers. And of thieves – even as a baby, Mercury couldn’t resist stealing Apollo’s cattle…. Was Sebastiano Ricci telling us that Mercury was the dominating spirit of the Council of Trent? Certainly the Council required, and still requires, Roman Catholics to honor many traditions which the Bible either condemns or does not authorize. Yet the Council also required, and still requires, that the Bible be honored as divinely inspired. Honoring the Bible by advocating unbiblical norms? This calls for a skill worthy of the Psychopomp, a skill that makes one believe that black is white. As we’ve seen, this is the Jesuit skill – securing obedience of the subject’s understanding. If indeed the Society of Jesus performs the function of Mercury, it is participating in a natural process known to pagan and biblical scriptures alike, a process by which impure humanity is attracted to oblivion, leaving behind only the pure. The theological implications of this process we shall discuss toward the end of this book. And there Carroll was, for the six months during which time the Tea Act erupted into the most explosive scandal of the revolutionary epoch, poised in Tisbury to facilitate information between these two personal friends of his, geniuses, institutions. But where is the evidence that anything bearing on the American Revolution transpired between Ricci and Thorpe and Carroll and Franklin and Howard and the entire Anglo-American Masonic system? We are left with nothing but clues and outcome, which nonetheless emphatically point to a fruitful collaboration. Parliament reacted to the Boston Tea Party in a way calculated to increase dozens of rolling boulders into a devastating landslide. 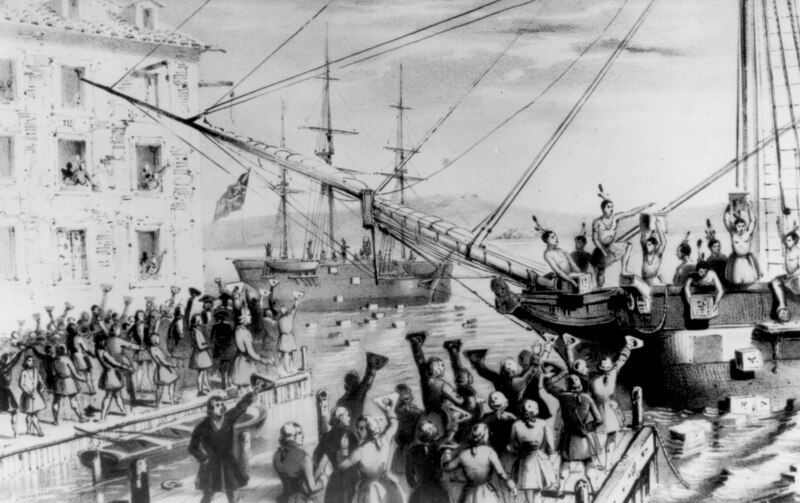 Without seriously inquiring into who was responsible, and wholly disregarding the offer of more than a hundred Boston merchants to make restitution, Parliament rushed into law a mass of unreasonably punitive legislation – closing the port of Boston to trade, forbidding town meetings without the consent of the governor, denying the Massachusetts legislature the right to choose the governor’s council, providing for the quartering of British and Hessian troops in the colony, and ordering that any officer or soldier of the Crown accused of an act of violence in the performance of his duty should be sent to another colony or to England for what would surely be a sweetheart trial. On March 23, Patrick Henry delivered his famous “GIVE ME LIBERTY OR GIVE ME DEATH” oration. On April 19, at a tense daybreak confrontation on Lexington Green between a group of angry colonists and some eight hundred redcoats, an unseen and unidentified shootist fired on the redcoats from behind a nearby meeting-house. This was the “shot heard ’round the world” – although Ralph Waldo Emerson coined that phrase in his Concord Hymn (1836) to describe a skirmish at Concord Bridge, seven miles away and a few hours later. The air on Lexington Green crackled with exploding gunpowder, and when the smoke cleared, eight colonists lay dead. As the redcoats returned to Boston, they were attacked by ever-increasing colonial militiamen. The Massachusetts Provincial Congress mobilized 13,600 colonial soldiers and placed Boston under a siege that lasted for almost a year. To prevent the spread of the Boston carnage to the Quaker province, the Pennsylvania Assembly named Charles Thomson and twelve others to a committee to purchase explosives and munitions – the leading manufacturers of which happened to be Thomson and Charles Carroll. On May 10, the Second Continental Congress convened in Philadelphia and named George Washington commander-in-chief of the Continental Army. On June 22, Congress voted to issue a continental currency – two million dollars in unsecured bills of credit – to be used in paying the costs of war. On July 3, George Washington formally assumed command of the Continental Army, about seventeen thousand men gathered in Cambridge, Massachusetts. prevented George III from seeing Penn or even acknowledging the Petition. On July 6, Congress adopted the Declaration of the Causes and Necessities of Taking Up Arms, which fell short of asserting independence, but vowed a holy war of liberation from slavery. On August 23, George III issued a proclamation declaring that all thirteen American colonies were in a state of open rebellion. Two months later, in October, British forces burned Falmouth, what is presently Portland, Maine. The war was on. But from [Jesuit Superior General] Lorenzo Ricci’s vantage point, the war was won. There remained only opportunities now for his enemies, the British Crown and the American colonials, to engage in blood-letting hostilities that would eventually separate and exhaust them both. Divide et impera, divide and conquer. What to the British was “the War of American Rebellion,” and to the Americans “the War for Independence,” was to General Ricci “the War of Reunification with Protestant Dissidents.” From it would rise the first Febronian government on earth, a constellation of secular churches called states led by an electorate of laymen properly enlightened by the ratio studiorum and united under the spiritual guidance of Pontifex Maximus, and paying tribute to Rome for the privilege. United … States. ratio studiorum: Latin “method of study;” the educational process by which the Jesuit schools and colleges obscure the moral supremacy of the Holy Bible and secure tacit obedience to the will of the black papacy. Pontifex Maximus: ancient title first applied to head of Babylonian civil and religious government, meaning “supreme (or sovereign) bridgebuilder;” first assumed by Roman autocrats at the deification of Gaius Maria as Julius Caesar in 48 BC; title owned by the Roman popes. The real war over, there began now the unraveling, which was the historical war, the theatrical war. This would consist of a series of bloody battles mounted by Congress and Crown for the people’s participation, observation, and commemoration. These events would produce Caesarean Rome’s essential emotional cornerstone. 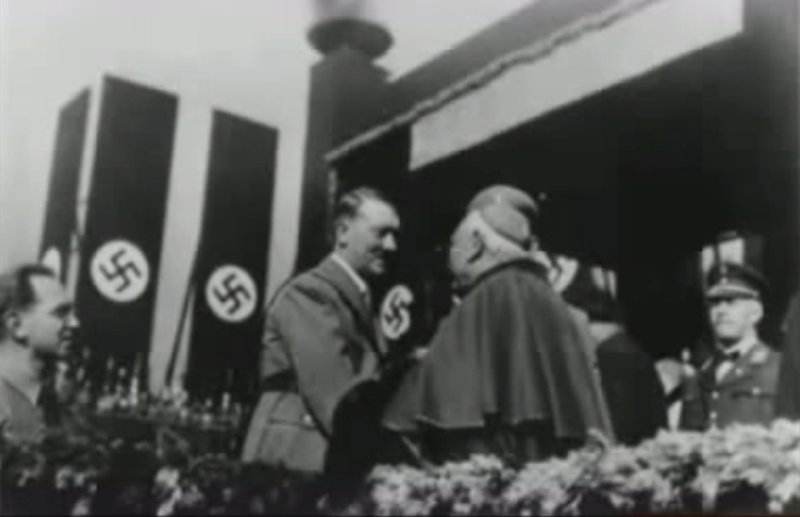 This entry was posted in Roman Catholic Church, The Papacy and tagged Adolf Hitler, American revolution, Black Pope, Catholic Church, Council of Trent, F. Tupper Saussy, Iñigo de Loyola, Illuminati, John Hartnett, Knights Templar, Lorenzo Ricci, Papacy, Roman Catholic Church, Rosicrucians, Teutonic Order, Vladimir Ledochowski. Bookmark the permalink. I wish everyone would read this book! The Waco massacre would not have happened if David Koresh had truly followed the New Testament teaching of Romans 13:1-4.